One of the folks that I had the privilege of chatting with while I was on the May 2013 Low-Carb Cruise was Scott Merritt, who discovered low-carb about 6 years ago. Since that time, in an effort to gain more control over his own food supply, Scott went to the extreme of purchasing his own farm. I first met Scott on the 2012 LC Cruise. After the 2012 LC Cruise, Scott started a new FaceBook group which he whimsically named “Friends of Bob A,” and organized some local “Meat Ups” at low-carb-friendly restaurants in the north DFW area. 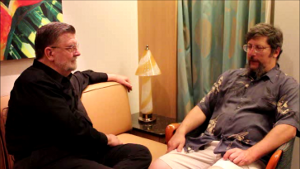 We corresponded several times in the last year, and he graciously agreed to do a video interview on the 2013 cruise. We discuss his journey to better health in this video. This entry was posted in Diet, Health, Low Carb Cruising!, Meat-ups!, Nutritional Research, Podcasts. Bookmark the permalink.